You can find the link to this here. Weekend Ponderings: Never Give Up! It took four months, but he DID IT! 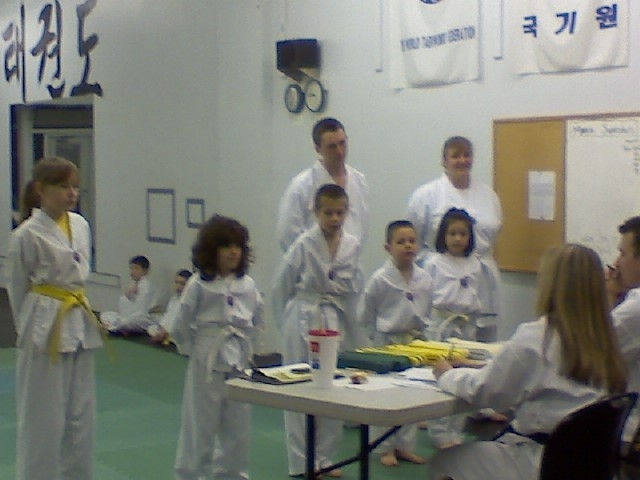 Christopher is now a 9th geup, and has his bright yellow stripe on his formerly boring-white belt! Yippee!!! Standing at the table before their instructors, the students were questioned about their knowledge of tae kwan do. Standing in front of a sea of parents, it must have been very scary to go through an oral exam. One little boy couldn’t identify the American flag on the wall (and none of his classmates appeared to be in any rush to answer the question, either). They were doing their best … but the pressure was on. This weekend, the second reading (from the book of Philippians) reminds us of our heavenly citizenship. All the nerve-wracking ordeal, the butterflies in the stomach, the moments of not knowing the right thing to say at the moment we most need to say it … gone. We will exchange our lowly “belt” for an exalted one, secure in the knowledge that we have run the race, and won. As parents, we have an even more sobering responsibility: Not only to prepare ourselves for heaven, by the grace of God, but to help our families get ready as well. All the stories of faith, hope, love, and the other virtues; all the careful coaching in faith and life choices; all the effort we pour into the moral formation of our children. We can never give up; the stakes are too high. This Lent, let’s run the race before us with endurance, so that when Easter arrives we can celebrate like Christopher did when he got his new belt: Dancing for joy!